Open image in new tab to enlarges. A new editorial at Investor’s Business Daily explains: Don’t Join The Media Freak Out Over Recent Jump In CO2 Emissions — It Won’t Last. Excerpt in italics with my bolds. CO2 Emissions: For the first time in years, U.S. carbon dioxide output rose last year, a new report says. The jump has set off alarms in all the predictable media quarters. Relax. It’s a great sign for the economy, and will mean nothing long term for the environment. CO2, the main greenhouse gas that global warming advocates most fear, happens to be rising around the world right now. It has been for decades. But in recent years the U.S. has been the big exception to that trend, with declining amounts of CO2 spewed into the air from its industry. The reason for this is that, thanks to fracking, companies and utilities around the country are replacing coal with natural gas. At least, that is, until 2016. But in 2018, U.S. carbon dioxide output jumped by 3.4%, according to Rhodium Group, a research firm. It’s not hard to understand why. Thanks to a booming economy set off by President Trump’s new trade deals, tax cuts and deregulation, in the past two years the U.S. has seen manufacturing jobs surge. Indeed, since Trump entered office, the number of manufacturing jobs has jumped by close to half a million. Once-moribund industrial areas around the country, many of which voted for Trump, are coming back to life. Minority unemployment rates are at or near record lows. Meanwhile, wages rose 3.2% last year, the fastest in a decade. These are good things. This is prosperity. Sources: US Federal Reserve Board and MAPI Foundation. All those people going back to work in refurbished factories in America’s Heartland — you remember, the ones Hillary Clinton called “deplorables” — helped push emissions from manufacturing up 5.7% last year alone. Transportation also contributed, of course, in the surging economy, with jet fuel (up 33.1%) and diesel fuel (up 3%) posting solid gains. A growing economy also means more electricity demand. Emissions in the electricity producing sector jumped 1.9%. Then there’s the irony of ironies: some of the increase in greenhouse gas emissions, which activists fear are causing runaway global warming, was due to an unusually cold winter last year. That’s right: Businesses and homes used more fuel for heat than they have in years. Rhodium noted that CO2 from this winter effect rose 10% in 2018. Are these bad things? No. Not at all. First off, people need to heat their homes and businesses in winter. That’s a given. Anyone who doubts that deserves the scorn and ridicule that surely would come their way for suggesting otherwise. 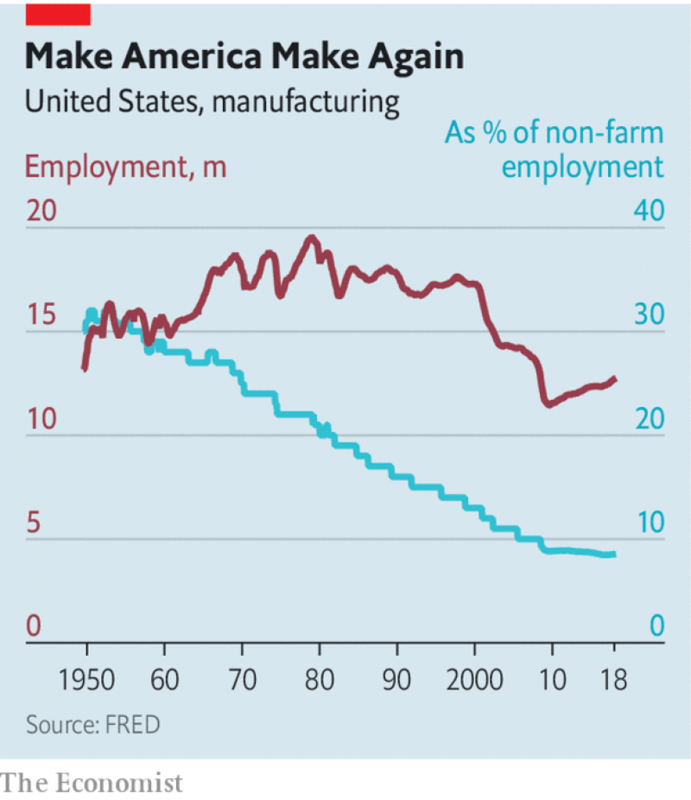 Second, those who have regained their jobs in factories across America should be cheered after living through years of steady, unremitting industrial decline. That some media outlets are now treating the very recent rise in CO2 output as some epic tragedy, please. A healthy economy always produces more CO2 when its growing fast than otherwise. Our current growth rate is roughly 50% higher than it was under President Obama. If it didn’t produce more CO2, that would be surprising. “The boom in manufacturing is good news for American workers,” said The Daily Caller, “however, major media outlets sounded the alarm on global warming.” Both Washington Post and Bloomberg . The Post was worst, claiming the “world has only about a decade to make the ‘unprecedented changes necessary” to stave off climate disaster. Of course, such predictions of doom are based on statistical models that have proven wrong repeatedly in the past. That’s not science; it’s little better than a Ouija Board. And yet, these prophets of climate doom would have us slash CO2 output and destroy hundreds of thousands of jobs just to satisfy the demands of the green socialist movement. By the way, those gains in CO2 won’t go on forever. The next slump or slowdown will take care of that, by causing many companies to close and many people to lose their jobs. And fracking will continue to chip away at our CO2 emissions. Meanwhile, around the world, countries are abandoning their restrictions on CO2 emissions that have impoverished them and angered voters. They’re also throwing aside the idea of punitive carbon taxes. People want jobs. They want incomes. They want better lives. And taxing them and the businesses they work for so that they’ll be poorer and pollute less creates resentment, even rage. Just ask France’s Gilets Jaunes, who have nearly paralyzed President Emmanuel Macron’s administration over his proposal for higher energy taxes. It should be a warning to U.S. Democrats, who hope to parlay fear of a changing climate into total control of the U.S. government. As Nancy Pelosi said earlier this month, on becoming House speaker again, “We must… face the existential threat of our time: the climate crisis — a crisis manifested in natural disasters of epic proportions.” This is nonsense on steroids. The truth is, the world is getting much cleaner, when measured by CO2 output per dollar of GDP. So is the U.S. It’s decarbonizing. And as the world population begins to decline later this century and new energy technologies come on line — everything from new battery technology to ultra-safe nuclear power designs — CO2 emissions won’t be a problem, real or imagined. The real problem? Having enough people working and paying taxes to support all the retirees around the world and pay off hundreds of trillions of dollars of global debt. What is a problem is the nonstop fear-mongering, demands for more taxes, and dangerous socialist experiments in expanding government control of the economy, all in the name of warding off the threat of global warming. So don’t worry about this jump in CO2. It won’t last. But the damage from bad green policies foisted on the economy will.